“On Galvanism” is an incomplete, piecemeal work, intended to be a spark of the match that ignites some larger project as opposed to the entire fire itself. In graduating college and taking an indefinite, perhaps permanent leave from formal scholarship, the opportunity to explore Frankenstein in a video essay appealed to me as an appropriate way to begin what looks to be a piecemeal, stitched-together life across the borders of research and artistic creation. Most works of science, into which category much of my own work falls, owes a debt to both Mary Shelley’s 1818 novel and the James Whale-directed movie adaptation a century later, as the book’s dissection of character creation and scientific control grows ever-more relevant as the pace of technological innovations and global infrastructure change rapidly increases. At its core, the concept of galvanism is similar to the idea of a soul; that the whole is greater than the sum of its parts. 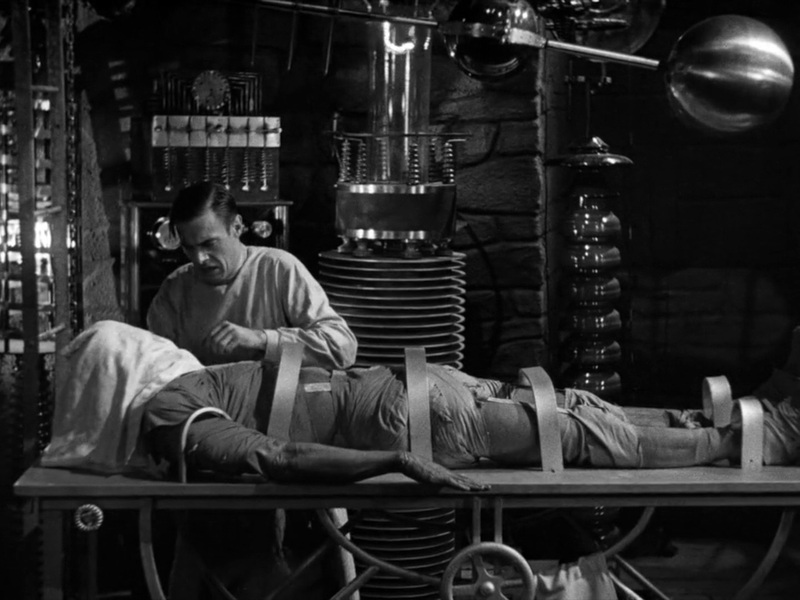 In the case of Frankenstein’s monster, all his disparate body parts, even with the addition of a brain (in the movie, a criminal one), isn’t enough to bring his body into motion. It needs electricity: some sort of outside spirit imbued in the body to make it run and come to life. In the case of any work of art, whether that be a novel, a movie, or a song, each individual part is lessened without the context of what’s around it. Alexander R. Galloway describes a network as a “system of interconnectivity” that “holds those parts in constant relation” (283). While the “system of interconnectivity” in a work of art isn’t necessarily its “spirit,” it’s a more easily understandable way of viewing the work of an artist put into creating. Hence the intensity of critical focus, in some circles, on the narrative structure of a piece and how it “holds up” to the other works in its field. The myth of Frankenstein lies in direct opposition to this tendency. To have spirit, to be imbued with “galvanism,” is for the art to have the agency to resist the conventional structure imposed on it. One with a weak structure, or lack of one, can’t do that; but a work whose own, unique spirit gives rise to a unique, individualized structure tends to break those norms and never look back. Not that this essay does that; it just offers a bit of historical, literary hope that it can, after all, be done. Galloway, Alexander R. “Networks.” Critical Terms for Media Studies. Eds. W.J.T. Mitchell and Mark B.N. Hansen. The University of Chicago Press, 2010. 280-296. Ruston, Sharon. “The Science of Life and Death in Mary Shelley’s Frankenstein.” British Library, 2014. https://www.bl.uk/romantics-and-victorians/articles/the-science-of-life-and-death-in-mary-shelleys-frankenstein. Spencer Slovic graduated from Stanford University with a degree in Film and Media Studies in 2018. His work is primarily interested in the emotional and behavioral potentials of slow cinema and science fiction, and his published essays and video essays include “Slowness and Slow Cinema” (Film Matters, 2018), “The Animal in the Lake” (Manicule, 2017), and “Nobuko Miyamoto, A Taxing Woman, and the Zany, Gendered Comic Body” (Much Ado About Cinema, 2018). His one-act play The Resurrectionist, about a father who brings his son back to life with a computer program replacing his brain, won the Young Playwrights Inc. National Competition in 2014 and is currently being adapted for the screen. Spencer seeks to find an intersection between scholarship and creative pursuits, and he welcomes any opportunity to write or reflect on the visual medium as he pursues his creative projects in Los Angeles.